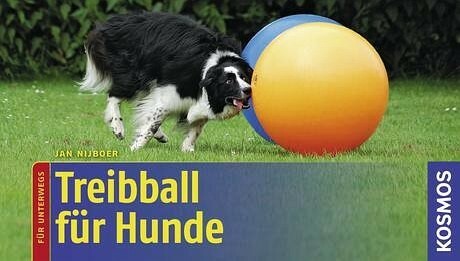 Product information "Treibball fuer Hunde"
At last! Now all herding, chasing and hunting dogs are no longer bored and without work – because now they can herd balls instead of sheep! For “Treibball” (herding ball) eight large colourful gym balls are shoved across the lawn and pushed through the goal. The dog owner takes an active part, helping his dog with whistling, little orders and body language. It is all about skillfulness, cooperation between man and dog and above all about a lot of fun. Longeing is the new fashion with dog owners and in dog training schools. My dog understands every word - at least, this is what many dog owners think. Train and occupy them - with fun and success. Train successfully with the 8-week plan.